Every 14.6 seconds someone commits suicide. Suicide is the 10th leading cause of death overall according to National Institute of Mental Health. When it comes to discussing mental health in African-American communities we stay quiet. Mental Health can be looked at as a cultural thing and that Black people don’t experience mental health issues. As someone who was suicidal, I can say people have been mean and brash when addressing me. 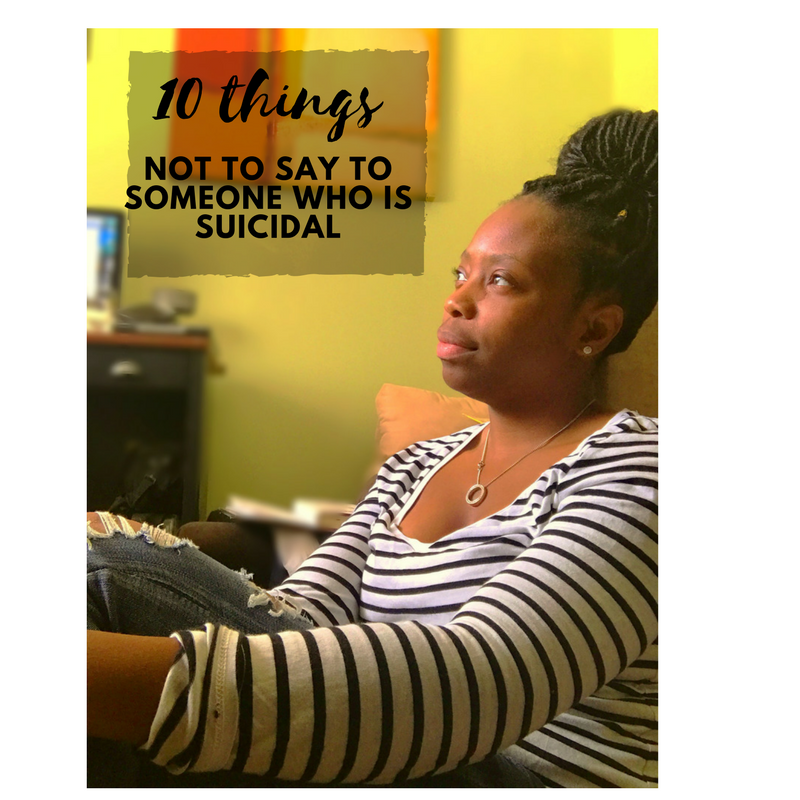 Below I list 10 things you should not say to someone who is suicidal. Your just looking for attention. Telling someone they are seeking for attention is dismissing what the person is feeling someone said this to me and made me feel as though my feeling were no longer valid. Your simply not praying enough. In the faith-based community, we tend to think that people have certain issues because they are not praying enough. That is not true but they may need extra help to sort through their feelings to understand why they are suicidal. It’s a demonic spirit. While as spiritual beings we work in the spirit not everything is a demon possession it could be a doorway that was opened that came from trauma it could be an experience or a generational curse that needs to be broke. When speaking to people who are not in the faith its important to not just label them as demonic. It’s all in your head. By telling the person it’s all in their head is dismissing what the person is feeling and making the person feel guilty about what they are feeling. I can’t be around you like that. You make the person feel dirty and as though because of what they are going through they are not worthy of being with you. Your so selfish. You only think about yourself. I would never do that to myself. Your going straight to hell. You should be admitted to a psychiatric hospital. God saved me from suicide and the church didn’t help me deal with my mental health issues, they were ignored. How I overcame suicide, God had to reveal to me what the underlining thoughts were that lead to suicidal thinking. My mother died when I was six years old so a seed was planted that I was the blame for my mother’s death. I will give you some things that lead up to the thoughts of suicide and how I combated them with the word of God. You are alone – There is no one in the world going through what I am going through. How many of us sit in church and feel like no one understands what I am dealing with and that could be further from the truth its important to have honest and transparent moments in our churches so people don’t feel isolated. Matthew 28:20 says, “And teaching them to obey everything I have commanded you. And surely I am with you always to the very end of the age”. The world would be better if you are not in it- The feeling of not having purpose. Exodus 9:16 says, “But I have raised you up for this very purpose, that I might show you my power and that my name might be proclaimed in all the earth”. No one loves me anyway- The idea you are not loved you are here my accident. Isaiah 64:8 “For I know the plans I have for you, declares the Lord, plans for welfare and not for evil, to give you a future and a hope”. Listening goes a long way. Listen to the person sometimes you don’t have to say anything. What In The Mind Is Going On?